A fire has broken out in the Moscow Ostankino TV-tower, according to Moskovski Komsomolets. 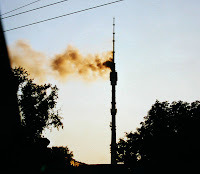 The famous tower, a scene of the 1993 shootout between president Yeltsin and parliament, was set ablaze in 2000, killing tree people and halting national broadcasts. Ostankino was last set ablaze in 2005, and fire safety is apparently becoming an increasing problem for the 40-year old building. This time though, the fire is not considered very serious, and it is limited to a segment at a 30-40 meter height of the tower. With its 540 meters, Ostankino is one of the tallest - if not the tallest - buildings in Europe. It was inaugurated in 1967, and has remained a well-known part of the Moscow skyline. Ostankino was constructed by famous Russian building-engineer Nikolai Nikitin - creator of inter alia the Moscow State University high-raise, the Warzaw palace of culture and science, and the Volgograd "Motherland Calls" giant statue. Between 1 and 30 June this year, the Blog-Carnival Russian media will take place. Initiated by the Swiss blog Krusenstern, bloggers with an interest in Eastern Europe will write articles and op-eds on the development and situation of media in Russia. The blog carnival concept is not a new phenomenon to the blogosphere. As Krusenstern writes: "The name 'Blog-Carnival' goes back to the 'stone age' of blogdom (September 2002! ), when American bloggers organised an event called the 'Carnival of the Vanities' designed to bring together the widest possible range of opinion using the simplest of means." He continues: "The aim of the Blog-Carnival is to gather together as many different viewpoints and pieces of information as possible on the subject of the 'Russian media'. Behind this initiative is the notion that the closer we get to the Russian parliamentary elections in October 2007 and the presidential elections in March 2008, the more the Putin government is clamping down on the media in Russia." Registration for participation is between 11-31 May, and further instructions are available on Krusenstern's blog. During 1-30 June, individual bloggers then publish pieces on the topic of Russian media on their own blogs. Contributions in English and German will be accepted. I would recommend anyone with the time and interest in this important topic to participate in the Blog-Carnival Russian Media. It is - as far as I know - the first blog carnival dealing with Russia or Eastern Europe, and thus an opportunity not to be passed over to strengthen both the regional blogosphere and your voice as a blogger. We will cleanse Russia of all non-Russians! This was the message relayed in print on British Burton menswear store's new T-shirt, The Guardian reports. Had it not been for an attentive language student, Britons in the thousands might have gone around proclaiming Russian racist propaganda. Instead, Burton realised the blunder and quickly withdrew the shirts. Language difficulties have caused a lot of misunderstandings throughout human history. The ancient Greek called people of foreign tongue barbarians, as they thought other languages sounded as a constant bar-bar. In biblical mythology, God prevents man from building the tower of Babel by introducing a variety of tongues among the hubristic constructors. Hence, the term Babylonic, to signify language confusion. That language difficulties occasionally cause misunderstandings even today is far from uncommon. Usually, however, mistakes are rather harmless. This time, though, a major clothes retailer unknowingly distributed a grossly racist product. 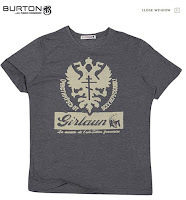 The grey Burton T-shirt in question centred the Russian double eagle with Orthodox cross surrounded by the text "Очистим Русь от всех нерусских!" (We will cleanse Russia from all non-Russians!). Wearing a T-shirt like this would be illegal in Russia and could possibly lead to police arrest. Let's but hope no poor ignorant British tourist in Moscow or St. Petersburg has ended up in such a predicament. Though, as a Swede, one should perhaps not be so cocky about inappropriate brand or product names. Swedish furniture manufacturer IKEA is infamous for its stupid naming policy. Would anyone buy a desk called "Jerker", a workbench called "Fartfull", or a chair called "Beslut"? Actually, people do and IKEA somehow gets away with it as part of their clean an innocent Scandinavian image. However, this is not something Burton did with its racist T-shirt, and rightly so. Hopefully, Burton will now have the sense to hire a language expert for future deliveries. A new Swedish-German expert group on the 1994 M/S Estonia catastrophe does not exclude an explosion as cause of the shipwreck. Such a conclusion has so far been ruled out by all other investigations, but few explanations have been given for the fast course of events when the ship went down. On the evening of 27 September 1994, the Estline ferry M/S Estonia left Tallinn heading for Stockholm, with 989 people on board. Around midnight, the ship came into difficulties and at 00:23 hours sent out a distress call to ships in the vicinity. Exactly what happened after M/S Estonia's mayday is still in dispute, but the ship went down within the ensuing 20 minutes, taking with it 852 lives. It was by far the biggest ferry catastrophe ever in the Baltic Sea during peacetime. The catastrophe occurred little over a month after the last Russian troops had left Estonian soil. It thus came at an inconvenient moment for Estonia, as the country had just regained full sovereignty over its territory. Consequently, the stage was set for widespread speculations and conspiracy theories. Despite the fact that numerous investigations, reports, and commissions of inquiry have concluded that there was no foul play, such theories still linger on. One of the most widespread speculations is that the Russian secret services would have placed a bomb on board, due to alleged smuggling of Russian military equipment by the Swedish military intelligence service. The Swedish military service has later admitted that it transported such equipment on M/S Estonia, but claims that so was not the case at this specific time. Then, why did M/S Estonia sink? Most analysts agree that the main cause of the catastrophe was that the bow visor of Estonia was torn off by hard waves, causing also the front ramp of the ship to come loose. The immediate effect was that the sea flowed directly onto the car deck of the ferry, causing it to capsize within the course of less than half an hour. What the new expert group, commissioned by the Swedish government, will do is to review various alternatives to explain why water penetrated the ship so quickly. The assumption remains that the main reason was the loss of the bow visor, but researchers will also scrutinise complementary explanations. One is that a hole would have been ripped open in the hull of the ship due to an explosion, which several survivors claim to have heard. However, no hole has so far been found to account for such a theory. Additional theories is that ventilation shafts would have facilitated the flow of water through the ship, and another that it came in by crushed windows. All in all, the research group will analyse eight additional or complementary scenarios causing the catastrophe. So, should this news lead us to assume that there was foul play in the Estonia catastrophe? Most probably not. The only thing this research group will do, is really to go over all evidence again without prejudice and thereby include any possible hypothesis. It is not very likely that they will reach any other conclusion than has previously been made. Still, the Estonia catastrophe remains a national trauma in both Estonia and Sweden, so it is understandable that no stone will be left unturned in trying to wholly explain the shipwreck. An Estonian report was issued only in March this year, and the new Swedish-German expert group will probably not be the last to look into the matter. What is perhaps the most tragic thing about continuously new reports about the Estonia catastrophe is that the families and relatives of the victims are never really allowed to put the issue at rest. After nearly 13 years, rumours are still at sway about what really happened, regardless of all inquiries and reports. Given the evidence produced so far, it is highly unlikely that M/S Estonia was sunk by an explosion. Still, also among the families there are many that will never learn to accept what happened and are trying to find explanations that simply might not exist. Paradoxically, not being able to put a thing like Estonia behind oneself is part and parcel of the tragedy itself, so the future will probably hold a stream of reports gradually turning into a trickle, as the people affected by Estonia gradually pass away. For today and the future, this is the greatest tragedy. 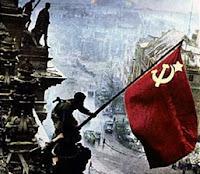 Today marks the 62nd anniversary of the Soviet victory over Nazi Germany. It is a day to commemorate the victims and sacrifices of the insanity of war, regardless of nationality, religion, or ethnicity. May the memory of the fallen never be tainted by the exploitation of states and politics. May they live on in eternal memory of man. As relations between Russia and the West deteriorate, a growing tendency to misperceive Russian motives is discerned. Russia is not a monolithic power, but analysts increasingly tend to give prominence to factors that themselves cannot wholly explain Moscow's actions. A recent example is the Russian-Estonian crisis. The current crisis between Moscow and Tallinn has its specific origins, and should come as no surprise to most observers. The basic preconditions for crisis were set already in the early 1990s, and both parties are since stuck in a mutually detrimental relationship. The difference this time though is that there currently are no countervailing forces in Moscow to keep the conflict in check, as has previously been the case. This is matched by poor judgement on the Estonian side. Also, the conclusion by western analysts that Russia is using its energy weapon against Estonia by imposing an export blockade seems flawed and an example of mental bandwagoning among people prone to single factor explanations. Public opinion in Russia about the Baltic states was forged from the disappointment of their determination to abandon the ailing Soviet empire. The Balts were considered part of the liberal and reform oriented forces in soviet society, why Russians felt betrayed by the Balts as Moscow perceivably strived towards the same political goals as the Balts were identified with. The realisation that the Baltics now were abroad took a long time for most Russians to come to terms with. That Russians had become subjects of a non-Slavic state in which they had to seek citizenship to enjoy the full rights of society was incomprehensible. That states like Kazakhstan might treat Russians badly was only to be expected, as they did not share the liberal heritage Russians associated with the Balts. A measure of double standards was thus introduced in comparing the situation of Russians in former soviet republics. As for the Baltics, Russians felt scorned in their identity as imperial civilisation carriers. An inferiority complex was thus the nucleus of the dispute over the situation of Russian "minorities" in the Baltic states. As things have evolved in Russian-Estonian relations over the last month, the image conjured up by Russian media is that of Russians being wronged and bereft of their rights and heritage. The difference this time is that there are no countervailing forces in Moscow to keep too overt nationalist sentiments in check. Still, most analysts limit themselves to describe the conflict in either bilateral or Estonian terms, whereas Russian domestic factors are left out. This limits reporting to developments of the same Russian-Estonian themes covered over the last 15 years, and old articles might be taken out of the drawer to be rewritten or updated, simply filling in the new facts. In essence, however, they lack the proper contextualisation to explain why the conflict has taken a new turn for the worse. Action is not enough - as the removal of the Bronze Soldier and its consequences. Context must be added to analysis in order for us to understand the full extent of the problem. Next year, Russia faces presidential elections. By all appearances it seems to be a runoff between Sergei Ivanov and Dmitri Medvedev. The power struggle in the Kremlin is however already underway, and who eventually will get the upper hand sways back and forth between the two main contenders. Half a year ago, Medvedev was in the lead, but now Ivanov has made a comeback and seems to be in the best position to become master of the Kremlin in 2008. In this context, Ivanov has used the Estonian crisis to gather his forces in front of a common foe. Opinions on Estonia are by now so deeply set that they may be used as a vehicle to gather the Russian masses. Previously, Russian leaders have known where to draw the line in using the "Baltic question" but now president Putin cannot put the foot down as too great interests are at stake, in who will rule Russian politics in coming years, to risk anything just to preserve a working relationship with Tallinn. As for relations with the European Union and Nato, Putin walks a thin line in risking a multilateralisation of the Estonian issue. However, Medvedev is also not left out in gaining the dividends of the Estonian crisis. Last week, Sergei Ivanov, during a meeting with governors in Murmansk, declared that the Russian oil and coal previously exported by transit through Estonia will now instead go through the port of St. Petersburg. Russia annually ships around 25 million tonnes of fuel oil, gas oil and petrol through Estonian ports. Imposing a Russian energy blockade on Estonia is regarded by many analysts as a way for Moscow to use its energy weapon. Such a conclusion, however, seems flawed as Estonia is relatively spared of any major consequences for its energy supply. Instead, it may prove a way for major Russian oil exporters - mainly Rosneft - to curve export competition by other Russian oil companies. Transferring exports to St. Petersburg will indirectly give Rosneft greater control over who will be able to export Russian oil. St. Petersburg port is already today gravely undersized - not to mention corrupt - and much effort has been made in recent years to construct new harbours in the Gulf of Finland - Primorsk for oil and Ust Luga for bulk. Opting for Petersburg therefore means that companies that previously have exported by way of Estonia now are at the mercy of Rosneft to meet their deliveries to western customers. In essence, the energy blockade against Estonia gives Medvedev's interests a way to hit at remaining independent competitors within the oil industry. Consequently, Ivanov reaps the political and Medvedev the economic rewards of the Estonian crisis. So, should all explanations based on the actual situation in Estonia and relations with Russia be discarded? Of course not. However, it is equally important to analyse the conflict on its own merits as it is to contextualise it, striking a balance on the domestic-foreign frontier. An obvious example is the risk that the conflict may spread also to Latvia. Most observers would say that situations differ too much for something similar to happen in Riga, but still Latvian authorities are apprehensive. From both a political and economic perspective, Ivanov and Medvedev may gain from sparking a crisis also with Latvia for the very same reasons why they have let the crisis with Estonia get so much out of hand. There simply is too much to gain and too little to lose domestically at the moment, that a Russian-Latvian crisis should not be ruled out just because situations in Estonia and Latvia are not similar enough. Giving the crisis a Russian domestic political contextualisation shows this. Still, is the Kremlin willing to risk its relations with the West - EU, Nato and the US - over such an insignificant issue as the Baltic question? Actually, such an assumption should not be ruled out. Already, Moscow is at loggerheads with Washington, and the US understands that it now has to be tough on Russia in order to have a working relationship. The European Union, however, takes a much weaker stand when it comes to Russia, and when it does confront Moscow it is on negotiation issues such as the Partnership and Cooperation Agreement (PCA) and the European Energy Charter. Until now, Russia has never had anything to lose in real terms in relations with the EU, and the Union consistently avoids putting its foot down in relations with Moscow. That Poland and other member states, in this context, may hamper EU-Russia negotiations is officially treated with resignation in Bruxelles, while most unofficially sigh with relief. Thus, Russia rationally calculates that the EU will never truly make a stand in their relations, why Moscow really risks nothing by a confrontational policy. 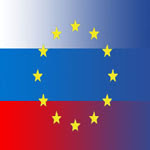 Developments in Russia are met with growing concern in Europe, and there is an understanding that sooner or later the European Union will have to confront the issue, as many of its members are already experiencing the realities of a more assertive Russia on the world stage. Doing so, however, sets out from, on the one hand, foreign relations and, on the other hand, Russia's domestic political situation. The latter is mainly directed at the crisis for democracy and human rights and far too seldom at the factors that Russian rulers themselves would deem of political importance. Foreign and domestic factors are increasingly treated as monolithic and attempts at joint analysis are often superficial or aim at the wrong factors. The result is that it is becoming all the more of a mystery in the West why Russia acts as it does. The West is once again allowing Russia to become "a riddle wrapped in a mystery inside an enigma" for the evident reason that Europeans are too subsumed by their own values, norms, perceptions, and prejudice to follow the simple logics of current Russian politics and society. Then it is much easier to produce an image of a state that once more might pose a threat to Europe - an alien entity accepted by its mere existence but doomed to remain foreign to Europe. Here, the Russian-Estonian crisis serves as a striking example of how the West fails to account for important factors in its perceptions of Russia. As European public opinion turns increasingly against Russia, the risk of misperceptions may become an even greater danger than a revived Russian threat in the eyes of Europe. Russian motives are not always what they seem.